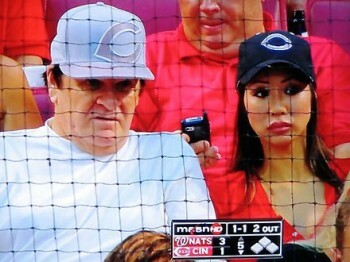 Pete Rose showing off his excellent taste in head-gear. Thought I think Rose probably makes enough money writing things on baseballs that he doesn’t need to hock the end tables, I still think it might be a Freudian slip. After all, pawn shops do kind of bring to mind the same ambiance as I imagine being around Rose basically all of the time. Rose has been such a big name for such a long time that it’s easy to assume he’s always been part of the baseball landscape, but of course that wasn’t the case. Fifty years ago today he was just a cocky young middle infielder who was certain he belonged in the major leagues. In his first trip to the big league plate on April 8, 1963, Rose got on base, though without getting a hit. Pirates pitcher Earl Francis walked him. Though Rose typically looked for a hit, he wasn’t excessively aggressive. He walked in about one-tenth of his big league trips, ending his career with 1,566 walks, 14th most all time. Chris provides a lot more details, and also enumerates a load of other events that make today special in history. Read the whole story over at The Hardball Times. “Wow! We’ll take it all!”…it’s just so poignant. This is an old picture from 2009, but he was probably wearing about the same shirt yesterday. The Reds won their second tough series in a row to start the season last night. Johnny Cueto put his 6 innings of 3-run ball again Steve Strasburg’s 5.1 innings of 6-run pitching to win the rubber game against the Nationals. The offense just barely got him the win, breaking a 3-3 tie in the inning when Cueto came out of the game. Sean Marshall finally got to make an appearance, having been unavailable before due to shoulder fatigue. Jonathon Broxton and Aroldis Chapman also put in an inning. All three of the relief innings were pointless. As in, no points were scored. Derrick Robinson, the young guy brought up when Ryan Ludwick got hurt, got his first major league hit and got to score a run when pinch hitting for Cueto in the sixth. He got a standing ovation for that. Jay Bruce was the most productive contributor, going 2-for-5 with 3 RBI. The Reds go to visit the Cardinals tonight. Mat Latos (RHP, 0-0, 4.05 ERA) will face off against Jaime Garcia (LHP, 1-0, 1.59 ERA). It’s one of those weird early-spring start times: first pitch at 4:15 p.m.
Todd Frazier has 9 RBI. That’s almost 30% of the teams’ total 38 runs so far. He’s also hitting .480 in 25 ABs. Of the 6 guys who have played in all 6 games, 3 are hitting over .300. NOT among them: Joey Votto. He’s hitting only .238. He has, however, taken 8 walks already. Even that only gets him the third highest OBP of those 6 guys. The one with the highest OBP is Frazier, of course. 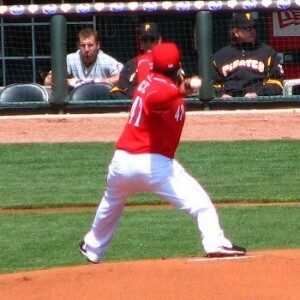 Second is Shin-Soo Choo. He’s 9-for-24 so far with 3 walks. He’s getting on base at a .516 clip. This guy has been a real boon so far. This is awesome! And I’m sure it’s going to last. The Reds were only 3-3 after their first 2 series last year against the Marlins (2-1) and the Cardinals (1-2).